Welcome to the InsuranceSplash recommended resources list. Here you'll find a collection of marketing services and tools from companies that we either use here at InsuranceSplash or we know well enough to recommend. If they're on this list, you can trust them. Hometown Quotes - Best system for filtering and high quality leads. Might be more expensive but many agents have told us the quality is worth it. Quote Wizard - High quality leads known for having excellent cusotmer service. Their leads are sourced differently than the other companies on this list so they're definitely worth trying. Aweber - This is the company we use at InsuranceSplash. They're known to have the highest deliverability rates and we know from personal experience that the customer service is excellent. CheapestURL - Insurancesplash.com and all the other domains we own are purchased through CheapestURL.com. They're the cheapest and the system is as good as it gets. GoDaddy - If you want the name-brand factor, and many agents to, you can't go wrong with GoDaddy. NinjaQuoter - These guys have the highest converting quote forms we've seen on our client websites. MyInsuranceVideos.com - A "done for you" video platform. 60+ Videos for your website, emails, & social media. New videos added monthly. WebPrez - Offers a complete library of convincing insurance sales videos for agents to use on their website or to send to prospects. Fiverr - Great way to get regular video content for your YouTube Channel. You can always find something on here to keep things active and you'll never beat the price. InsuranceSplash Websites - The easiest and most professional insurance websites money can buy with a support team that knows more about the insurance website marketing business than anyone. Google Analytics - The best website analytics system out there. It's what we use for InsuranceSplash and we don't know a good reason any insurance agent would need anything else. Plus, it's FREE! The Insurance Website Marketing Bible - Free eBook written just for agents by the most knowledgeable guy in the world of insurance website marketing. Everything you need to know for a successful insurance website. 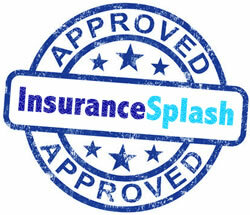 InsuranceSplash SEO Services - No contracts SEO service designed exclusively for insurance agents. Multiple SEO packages & services to choose from for your agency. Insurance Soup - If you're looking to dominate social media advertising join this free group. They'll teach you everything you need to know. SEO60 - Our popular 60 day program for insurance agency local search engine optimization. Lightico - Lightico helps agents sell smarter and transform the service experience by getting electronic signatures in real time with a mobile optimized experience. Insurance Ad Campaign Generator - The easiest way to advertising your agency online through search ads and social media advertising campaigns. Transparent fees - choose your own budget. RxSpark - Help your clients save money on prescriptions with a free discount card branded with your agency's information. Free to join. Kall8 - Great for call forwarding numbers and 800 number forwarding. Affordable and reliable. We've been a client since 2009. You can also use them for digital fax services. The Manko Company - Avery Manko is the man when it comes to promotional products for insurance agents. You don't just get the tchotchkes anywhere but Avery's advice is priceless. 99 Designs - You can't find better graphic design for your dollar anywhere else. Graphic designers compete for your job. And it's the same price as a local graphic designer. Fiverr - The very low-priced option for graphic design. Not spectacular, but cheap and quick and gets the job done. The Insurance Agency Marketing Experts.